People around the world have their own unique ways to celebrate special occasions. Gatherings and recreations are the main goals of such events. But, every celebration will not be complete if there are no feasts, because feasts are the heart of every celebration. It brings people together, relatives and strangers alike. In Russia, people celebrate special occasions very seriously. From spring to winter, you will find lots of festivals conducted in all across Russia. As the title mentioned it, some people in Russia will have some kind of bizarre foods that they eat on special occasions. Some of the foods are just a little unusual from our diet, but some foods also completely bizarre that you wouldn’t even think if that was foods. 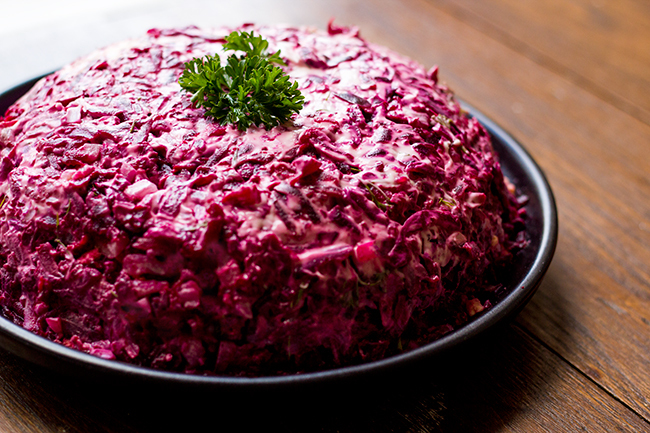 If you want to learn about bizarre Russian food that they eat on special occasions, check our lists of bizarre Russian foods below! (Note: Some content may be disgusting for squeamish people). When you think this salad is just like any ordinary salad with potatoes added, you’ll be disappointed. In a nutshell, yes, this salad is made using potatoes and some vegetables. But, what’s coming next might make you question about the name of this food. Aside from potatoes and vegetables, Russian also add meats or Doktorskaya kolbasa (Doctor’s sausage) for this salad. Some meat lovers also usually add more meats to the batch. When they say “more”, they really mean it. To top it off, smetana (sour cream) and mayo are added. Potato salads are popular among Russian during holiday times, whether it’s summer, winter, or any other holidays. And it is also a good food to accompany you when you’re reading books or watching films. 2. Selyodka Pod Shuboy / Herring Under Fur Coat. When winter is coming to Russia, not only people wear fur coats. Herrings too. But don’t expect to see a herring wearing a fur coat at a fashion show. That’s not going to happen. It has been a tradition for some people in Russia to eat selyodka pod shuboy (or “shuba” in short) during winter times. This food is made from herrings covered in layers after layers of potatoes, carrots, and beets on top (cheese can be added as well). This food had their name from its way of serving. Basically, shuba is a salty cake of Russian origin. At a glance, it’s looked like a strawberry cheesecake, but you will soon find out what it is when you tasted them. Holodets is a Russian food made from hardened pig feet (any meat, fish, or chicken will do) broth which has a high concentration of gelatin. The feet are boiled for hours to extract its gelatin. After the feet are cooked, the meats are pulled from the bones. The shredded meats and the broth then poured into a bowl or pot and stored in cold temperature until it’s become hardens. Because of its time-consuming process, it is common to see Russian family members gathered in the kitchen, preparing holodets. Holodets are widely consumed by Russian families during winter time, especially on Christmas and New Year. Holodets has a high amount of protein, but also a higher amount of fat. So do be careful when eating those. When you hang around in warm cities such as Astrakhan or Sochi, during the blazing hot summer day time, a bowl of Okroshka will help you survive the inferno. Okroshka is a cold soup (or vegetable punch?) made from varieties of raw vegetables, like cucumbers, carrots, radish, etc. For its dressings, Russian mostly use kefir, smetana or kvass. Eggs and kolbasa can also be added to add some extra proteins. Okroshka will give you fresh and crunchy sensation when eaten, perfect to eat as a dessert after lunch. When you venturing to the Republic of Buryatia to see Lake Baikal, you wouldn’t want to miss the chance to visit some of the local’s houses. There, they will welcome you with their best food and drink specialties. The Buryats have their own unique tradition to welcome their guests, especially the special ones. This tradition is called sagaalha in their language. They will serve guests well and provides them with all their best dairy products. Among all of the treats they provided, there are white wafer-like snacks piling on a plate. Despite its similarity, it is definitely not wafers. Introducing urme, a snack made from dried or frozen milk curd. When the Buryats cooked their milk in an iron pot, a thick layer of curd will form on the top of the milk. It will be getting thicker and thicker once it starts to cool down. The formed curds then carefully taken off and then dried when it is summer or frozen when it is winter. As an indigenous people of the Sakha Republic, the Yukagirs have learned to withstand any cold, even the coldest of winter. After months of their struggle, they will be rewarded with the blessing of summer. At that time, the Yukagirs will attend a festival called Sakhadzibe festival. During Sakhadzibe festival, clans will gather around to have some discussion and have a feast. On that feast, plenty of traditional foods are served. Some of the foods served are made from reindeer venison. One of the most unique food that you might find there is the fermented reindeer meat. The meat can be processed in sausages, steaks, and any other dishes that use meat as its main ingredient. The taste of this meat is not far different from regular meat once its cooked. Some claim it has better taste and texture than the regular ones. Yum! If you are feeling adventurous to explore Russia, you should visit the northeasternmost regions of Russia. There you can find the most extreme in all of Russia, both in climate and in foods. And also, you will meet the aboriginal tribes who settled there for millennia and have adapted to the frozen climate. Those people are cool! The Siberian Yup’ik and the Chukchi are some of the indigenous tribes who settled the region from Koryak Okrug to the western shores of Berring strait in Chukotka Autonomous Okrug. They are skilled hunters, fishers, and whalers. From their way of life, most of their diet mostly consists of reindeers, walrus, fishes and whale meat. Smoking is the best way to process their hunted meat since it was faster and could make meat lasts longer. Aside from daily consumption, the meats are usually used as an offering during ritual ceremonies. Meats aren’t the only food consumed by the Yup’ik and the Chukchi. Living in the frozen Arctic wasteland where most vitamin-rich plants could not grow, they still have to find their own good vitamin sources. Some of the most reliable sources of vitamins are half-digested plants which taken from reindeer intestine. As a human, we can’t effectively absorb vitamin and mineral contents from grass and moss, even when it is cooked. Fortunately, herbivores such as reindeers are able to break down the plant’s cell walls, so it would be easier to absorb its nutrition. When those tribes hunted a reindeer with bellies full of half-digested plants, they’re surely hit the jackpot. Just like the smoked meat, these plants are commonly used as offerings in ritual ceremonies. To eat the plants, just simply wash it with clean water and eat it raw. This food is definitely not for a wimpy stomach. Salad anyone? There you go, eight bizarre Russian food that Russian eats on special occasions. Russia’s colorful culture resulted in more colorful types of food. From the fanciest to the weirdest. Feeling squeamish yet? Hope not. Go ahead, try some of these foods at least once in your lifetime! No regrets.